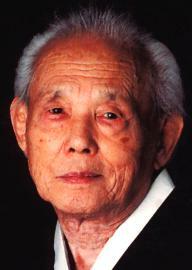 Kwan Jang Nim Hwang Kee was born on November 9, 1914, in Jang Dan, Kyong Ki province where the DMZ is currently located. His father, Hwang, Yong Hwan, had a dream in which he saw the bright star (Sam Tae Song) before his son's birth. He named his son "Tae Nam", which means "star boy". Later his name was changed to "Kee". His father was a scholar who had achieved a high level of academic recognition from the last King of the Yi Dynasty, Ko Jong. various kicks to the group of young men. Soon the group of young men fell one by one as a result of the man's strange moves. After the attack ended, some onlookers said, "That is Tae Kyun", and some said, "That is Sip Pal Ki", as they were departing. The Kwan Jang Nim was so impressed by this man's performance that he decided to find out what his art was about. He followed the man at a distance and discovered where he lived. Several days later, he approached the man's home and sat on a hill nearby and looked down at his house. He saw the man practicing some hand and foot movements with a partner. He watched their practice closely with great interest and he realized that these were the same techniques that the man had used facing the group of seven or eight young men at the May festival. After that, he often went near the man's home to watch him practice, and he imitated and practiced what he saw from the man's techniques. who would devote his entire life to Soo Bahk Do Moo Duk Kwan. high school graduates. The Kwan Jang Nim entered elementary school at the age of 11 and graduated high school in March 1935. Following his graduation, he went to Manchuria to work for the railroad company (May 1935). friend, Park, Hyo Pil, who worked with him at the Jo Yang Station. During this visit, he learned that Master Yang was teaching a handful of private students practicing a Chinese martial art in his home. He never lost his dream of learning the depth of the martial arts following his experience when he was seven years old. He had trained himself whenever the opportunity was offered and from whatever source was available during the past 20 years; however, he never had any organized or structured lessons, nor did he have access to formal instruction or any dependable literature on the subject. Mr. Hwang Kee was overwhelmed with happiness as if he were dreaming, knowing that he was at the home of Master Yang, who was highly renowned as a martial arts Master. He was served tea by Mrs. Yang. His first impression of Master Yang was of a man with a very gentle and healthy appearance with good energy, who looked to be about 50 years old. Master Yang was taller than Mr. Hwang Kee and kept his body healthy. That same day, Mr. Hwang Kee humbly requested to be Master Yang's student. Master Yang refused his request gently, saying that "I am not good enough to teach you." Mr. Hwang Kee and his friend, Mr. Park, could not speak Chinese well enough to present their sincere wishes to study at that time. That evening they had a good dinner at Master Yang's house, thanked the couple, and returned to their home. The next morning, he discussed things with his friend, Mr. Park, and they decided to visit Master Yang again and again until they were accepted. On their third visit, Master Yang finally accepted them as his students. They were so happy to be accepted that they practiced whenever they had the opportunity. Because of their work schedule, they trained every other day. Mr. Hwang Kee never missed practice with Master Yang. He accepted Master Yang's instruction sincerely and his progress was exceptional due to his sincere dedication and prior martial arts experience during the previous 20 years. Master Yang admired his dedication. Mr. Hwang Kee and four other students were training under Master Yang during this time. as their basic training. They also had trained in "Dham Toi Sip E Ro" and "Tae Kuk Kwon,"
which were disciplines of form and its combat applications. In August of 1937, he had to leave Master Yang and return to Seoul for personal reasons. During 1941, he went back to Manchuria for a short time to visit Master Yang for instruction. This was the last time he was able to enjoy Master Yang's instruction. He could not communicate with or visit his Master again once China became a Communist country in 1946.
arts known to the general public. People did not have any knowledge of Soo Bahk, Okinawan Karate, Chinese Wu Shu, or Kung Fu. Because of this situation, it was impossible for Kwan Jang Nim Hwang Kee to make his long-time dream come true. He spent long hours of meditation and self-conditioning during this time. was very peaceful and quiet because it was in a separate building a little distance from the main building. In this facility were located a lecture room, a library, and various exercise rooms. and this was the first modern form of martial arts books he had seen). during the early part of the Moo Duk Kwan history. on Okinawan Karate, as indicated in the Soo Bahk Do Deh Kahm (1970). which added to his experience and maturity in the martial art discipline. possible for Kwan Jang Nim Hwang Kee to fulfill his life-long dream to dedicate himself solely to the martial arts. human character, which proved an invaluable experience. The study of Okinawan Karate through the available books at the library while he was employed by the Cho Sun Railway Bureau in Seoul from 1939 to 1945 was also a great influence. From "The History of Moo Duk Kwan - Celebrating the 50th Anniversary 1945-1995"